What we do at Husky Rescue South Africa...we are a bunch of people who for the love of Huskies of all breeds rescue, foster, rehabilitate and re home them. This is how we go about it: We come to your house to do a home check. What can you do to ensure that you can pass this home check? Here are some guidelines... Ensure that your walls are high all around your yard with no sharp obstacles that can cause injury to a dog that might try to jump the wall.Check to see if you have enough water to play in and to drink during the hot summer days, are you able to provide shade during the whole day as well as shelter during rainy days. If you are able to provide your Husky with in house sleep accommodation at night time that is an added bonus. Also a companion dog friend is vital for the mental and physical health of a happy Husky. A good size yard is great but we are also looking for someone who will interact daily in activities, love and stimulation as Huskies are not back yard dogs or guard dogs at all. As soon as they are left to their own devices they start to destroy gardens, chew on irrigation pipes, dig holes and escape yards. We see this as a life long commitment for the remainder of the dogs life. We also provide the new owners with a contract signed with us. We sterilise all dogs, micro chip, vaccinate and de worm them. Because of these procedures we ask an adoption fee to cover those vet bills. 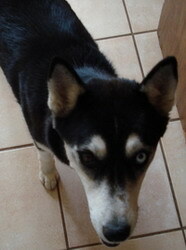 Ever so often we foster sick or injured Huskies and encounter extra unexpected costs that we need to pay our selves. We do appreciate sponsers, volunteers for foster homes, collars, food, donations etc and put all of these to good use. We have people in Gauteng, Natal, Bloemfontein and in Cape Town. For more info on us or about adopting a Husky please fill out the form provided below. We have on average 30 dogs needing homes. Click to go back to rescue work page.